At Engage we are on a mission to help the world develop less noise and engage more. We help entrepreneurs, executives and managers connect with, engage and inspire their audience. The single most effective strategy to connect with your market and sell more product. How to exponentially grow sales with a fraction of the work by focusing on the right things. How to develop a specific marketing campaign that motivates prospects to seek you out. We help you connect. We use a story framework that has been honed over centuries to frame your marketing strategy and marketing messages. This is how we can help you help your market fall in love with what you are selling. This is a much more effective way to inspire, engage and convince than boring people to death, or confusing them beyond all hope, which is the typical way we try to sell. If you are trying to engage anybody, anywhere, please download our template to avoid hours of useless marketing toil and inspire your audience easily. And come to this presentation. We will even provide the pizza. We all want the holidays to be times of family, warmth, and happiness. And often they turn into stress, running around and trying to survive until finally, they are over. It doesn't have to be that way. Your family, friends, and work can bring a lot of stress to the table (both literally and figuratively). Changing your perspective can impact the way you experience those moments and improve the experience for everyone. And it isn't even that hard. Join us on the 20th, for an introduction to mindfulness concepts, some practices that we will go through in the room and that you can take home. And have some fun: we'll have wine and cheese and laugh at least twice. By the way, we don't care what holidays you celebrate, just join us. In this workshop work with Jeff Loehr, CEO of Engage Now, to discover how to craft your message to engage stakeholders, empower marketing, and grow your business. Develop presentations that resonate with your audience. Clearly articulate how you enhance your customers’ success to revitalize marketing and sales. Business exists in language, using language effectively enables a new level of results. 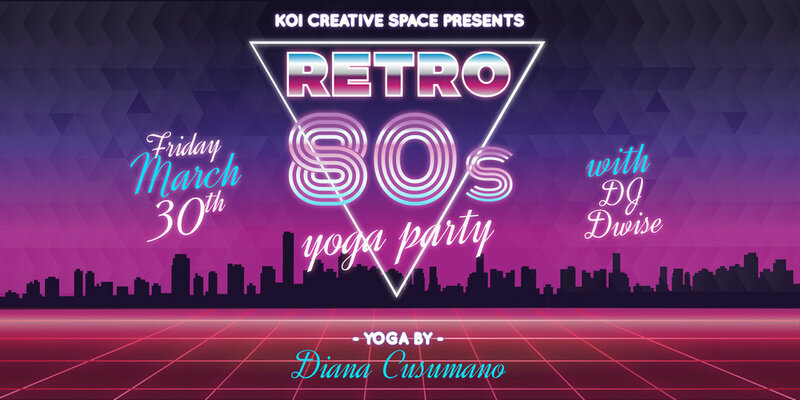 KOI Creative Space and The Jed Foundationpresents a master class with the one and only 99-years-young Tao Porchon Lynch, master yoga teacher and beautiful soul. Join Denise D'Agostino, founder of Possibilities+ as she provides a clear path to improving your leadership skills in business and beyond. Nervous about presenting to a group – or just not as polished as you’d like to be. Come learn 3 easy techniques to immediately improve. Practice and perform to get that sale, promotion or kudos! Join us for some perspective into the craft distilling industry at The Spirit of Business followed by tech demos from Westchester Tech Meetupstartups. This installment features Nahmias et Fils Distillery of Yonkers, NY followed by demos by Turbonomic and BingeWave. 7:15-7:45 | Nahmias et Fils Distillery tasting and conversation on featured spirit selections. Hudson Valley Master Distiller David Nahmias and his wife Dorit hand-craft their award-winning spirits with the finest, natural ingredients. They are proudly the sole producers of Mahia in the United States. Dorit —a former foreign-exchange trader and Master Distiller David, a former computer-software engineer, who was raised in the small Moroccan town of Taznakht. His parents, Joseph and Tamou, and grandparents Saada and Moshe, distilled Mahia, a unique Jewish alcoholic beverage; following the Jewish exodus from the region, his dad became legendary for being the last Jew to remain in Taznakht. Westchester Tech Meetup is a community-based initiative dedicated to bringing together entrepreneurs, technologists, and creatives to explore product development and collaborative innovation projects in the Lower Hudson Valley region. Founders and startup teams live demo products and solutions, and receive direct feedback from participants to support their bootstrapping, sprints and growth. Launched in 2010, Turbonomic delivers a hybrid cloud management platform that enables on-premises and public cloud to self-manage in real-time, thereby assuring performance, lowering cost, and continuously ensuring compliance. The Turbonomic patented decision engine curates workload demand to dynamically control resource supply, maintaining a perpetual desired state of application health. One of the fastest growing technology companies, Turbonomic is trusted by thousands of enterprises to simplify and accelerate their hybrid cloud journey. Recently named a Forbes Cloud 100 Company, an Inc. Fastest Growing Company, and a Deloitte Tech Fast 500 Company… and we’re just scratching the surface. BingeWave is an exciting and newer VOD service that better allows content creators to market and have more control over monetization of their projects through subscription based packages and advertising fees (Content creators, you decide the prices!). The mission of the company is to specialize in showcasing content created by and focused on underrepresented and misrepresented groups, therefore the content is more accurate and depictive in its representation. The vision of the company is to bring people together from diverse backgrounds through an educational and entertaining platform, servicing our subscribers, not just locally but globally through working with our media partners, network owners, content creators, and advertising partners. Ink & Drink, a great event for friends and groups, is an introduction to Brush Calligraphy with Lillian Liming Lettering & Design paired with cocktails and gourmet treats! Brush Calligraphy is an art form that has become a darling of Instagram. This is an introduction to the skills of Brush Calligraphy as a hands-on guide through the basics - from foundational brush strokes to forming and connecting letters into words. Everyone will take home their very own custom lettered postcard! In addition to learning the relaxing and viral art form, we will have popsicle champagne, craft beer, custom coffee and gourmet donuts and pastries! Hakuna Mimosa. It means it’s brunch time. Bloody Marys, Food, Smoothies, and Mimosas! What’s trendy, hip, and popular this summer? Join us for some perspective into the craft brewery industry at The Business of Beer Series. This installment features Harpoon Brewery of Boston, MA. 6:00-7:00 | A business presentation and talk followed by Q&A from Harpoon Brewery. 7:00-8:00 | Harpoon Brewery tasting and conversation on featured brew selections. Or $5 at the door. The Business of Beer Series | Feat. Two Roads Brewing Co.
Join us for some perspective into the craft brewery industry at The Business of Beer Series. This installment features Two Roads Brewing Co. of Stratford, CT.
6:00-7:00 | A business presentation and talk followed by Q&A from Two Roads Brewing Co.
7:00-8:00 | Two Roads Brewing Co. tasting and conversation on featured brew selections. Two Roads Brewing Company was founded in 2012 by four friends who dreamed for years of starting a craft brewery. We foster a “road less traveled” philosophy in the beers we make and how we make them. In that spirit, Phil Markowski, our award-winning Brewmaster and 27 year craft beer veteran has created an extensive lineup that takes a unique twist on classic beer styles. Join Victor Adefuye of Dana Consulting and learn the best practices in modern sales conversations and how to get and close the deal of your dreams. Victor is a creative and entrepreneurial sales professional with a passion for tackling big challenges. He founded Dana after seeing too many startups make the same mistakes around sales planning, hiring, and management. Victor began his career as an attorney, where he developed his communication and presentation skills. He then leveraged these abilities in his first sales role at Northwestern Mutual, where he was recognized as one of the top young producers in the company. Subsequently, Victor joined the entrepreneurial world, serving as Co-Founder & President of WellnessRebates, VP of Business Development at Apex Leaders LLC, and as a sales consultant to various B2B startups. He is a graduate of Duke University and The George Washington University Law School. The National Alliance for Mental Illness is raising money to raise awareness about Mental Illness - come get your yoga on for a donation amount of your choosing! Join us for a lunch-and-learn with Victor Adefuye of Dana Consulting and learn about the sales myths that will kill your B2B Startup and how to avoid them. The Women’s Enterprise Development Center will hold a Mother’s Day ‘pop-up shop’ with vendors and shopping! The event aims to support small local businesses who are part of the WEDCbiz (Women’s Enterprise Development Centre) mentoring and training program. Vendors and entrepreneurs from Westchester County and the Greater Hudson Valley area will participate, selling bath and body products, apparel, and accessories. These vendor’s focus will be toward items that would sell well pre-Mother’s Day. Price: Free admittance to the public. Join us for some perspective into the craft distillery industry at The Spirit of Business Series. This installment features Ralph Erenzo, one of the two co-founders of Hudson Whiskey & Tuthilltown Distillery Hudson Whiskey. 6:00-7:00 | A business presentation and talk followed by Q&A from Hudson Whiskey. 7:00-8:00 | Hudson Whiskey tasting and conversation on featured spirit selections. Fate is a fickle thing. In 2001, when we purchased the Tuthilltown Gristmill to open a rock climber’s ranch, the neighbors balked. So we had to find another way. The 240-year history of the mill led us to it. Grain, water, yeast and a new purpose: We decided to make whiskey. With our own skills and a lot of hard work, we converted the two granaries into the first whiskey distillery in New York State since Prohibition. We didn’t know anything about distilling whiskey. We decided not to think “out of the box.” Instead we burned the box and started fresh. For two years we traveled to distilleries and talked to experts around the globe. All the while building our distillery, acquiring our permits and waiting for our stills to arrive. It took six months of experimentation to produce great, rich whiskey by hand, one batch at a time. Along the way we changed the way whiskey is made and we changed our lives. The Industrial Revolution dies at the beginning of our driveway. We’re about handcrafted spirits. Our Distillerymen are always in direct contact with the materials and the spirit of the distillery. From grain to glass, we take great care and pride in all of our spirits. We’ve captured local flavor and ambience using the agricultural resources of local farmers while leaving a smaller footprint on the environment. Like true New Yorkers, we’ve toughed it out and thrived. Our staff is honored and thrilled to have been named “Best Artisan Distiller of 2010” by the American Distilling Institute. Just regular folk making whiskey that has earned its place on the top shelf. It was quite a climb, but it sure looks good from here. Prosper.Us Networking Group invites you to a happy hour and to enjoy some casual networking at KOI Creative Space with food, drink and many interesting and valuable professionals in attendance. Join us to see the research and then break down the barriers. This toolkit is designed to help overcome the invisible barriers created by gender bias and to foster equity in the workplace. Equity is all about giving people access to the opportunities and resources they need in order to overcome barriers and flourish. OneTable's first Westchester Nosh:pitality - come and learn how to make awesome cocktails with Gina from Hospitality Inc. (http://hospitalityincny.com/)! We're having the first KOI Holidays Party and you are invited. Join us at KOI Creative Space for tall glass of merry rounded out by a shot of holiday cheer. Bring food, drink or a friend. Wish it were easier to attract and close high-quality clients? Working hard and not getting the number or quality of clients that you really want? Even very successful firms endure “feast or famine” cycles of busyness followed by dry spells. Join us at November's Westchester Tech Meetup at KOI, Nov. 21st kicking off at 6:00. Come join tech entrepreneurs and creative thinkers for networking and discussions. Award winning Design Director, Author, top-ranking Podcaster (Giant Thinkers) and CreativeLive instructor, Ram Castillo will be be revealing clues to design success.